Our expert mixologists will show you that there are endless possibilities of cocktail combinations, if the cocktails aren’t enough to make your head spin then this definitely will. Our cocktail classes are 90 minutes of fun and will take place in one of Watfords many bars. A food platter will be included towards the end of the class for your group to dig into! Hen parties love our Watford cocktail masterclasses but they can be enjoyed by anyone wishing to have a great time doing an unique event! The cocktail masterclass begins with an introduction to the mixologist, who will familiarise the party with the cocktail making equipment (strainers, shakers, muddlers, glasses) used to make fabulous cocktails. The group will then take turns creating and shaking their own cocktails behind the bar, great photo opportunity! Once the cocktail masterclass has reached its finale, you will be shown to some reserved seating where you can finish your cocktails and enjoy a buffet. 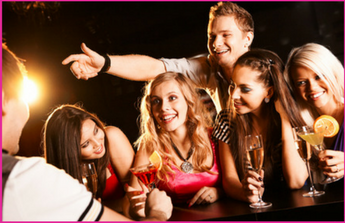 Our dance parties have proved very popular for many years for hundreds of hen & birthday party groups. Learn a fabulous fun filled themed dance routine, which you can perform throughout the night or even at on the big wedding day. Choose from a large variety of dance party themes including Single Ladies, Burlesque & Grease All the dance parties take place in city centre private rooms just for your group.